I have such trouble with chocolate cakes. They either dry out so they are like eating loose pumice, or, given a little less time in the oven, they are raw and sloppy. I think I’ve cracked it with this recipe. It’s an adaption of a brownie recipe laid over some of my bottled pears, in a classic ‘belle-Helene’ flavour combination. Mmmm! Chocolatey goodness. 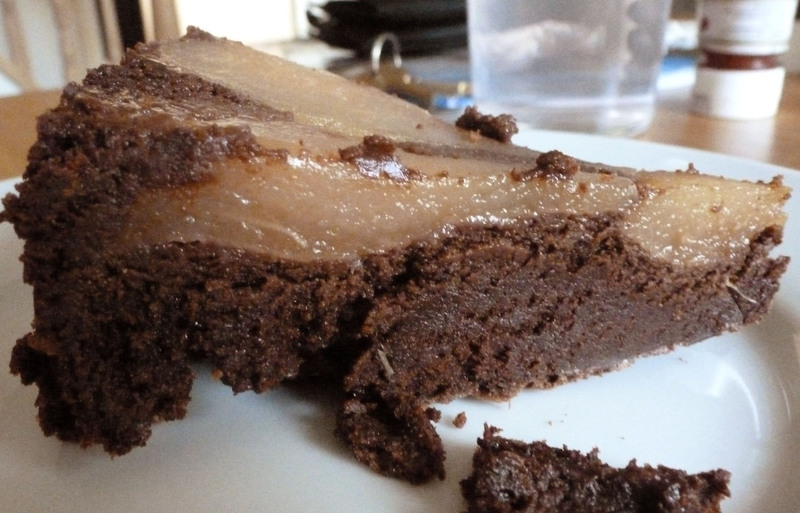 Chocolate and pear are such a great combination. Melt the chocolate and butter together, and allow to cool slightly, to blood heat. 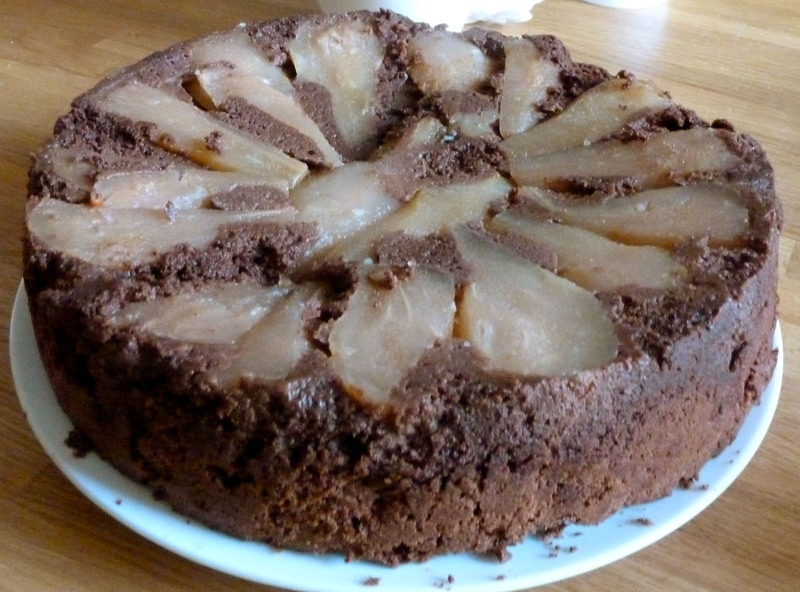 Grease an 8″ cake tin, and arrange drained pears on the bottom. Beat eggs and sugar together until pale, creamy and doubled in size. This could take up to 10 minutes, but don’t stint on this bit because I think it’s the key to the texture of the finished cake. Add chocolate and butter to eggs and sugar. Careful now! Fold it in very, very gently. Sift in the flour and cocoa powder, and again, fold very gently. You’ve worked hard to get that air in – don’t knock it out! Pour over the pears and bake in a moderate oven (160°), for 45 minutes. You can tell it’s done if you give the tin a small knock and it doesn’t wobble in the middle. Allow to cool in the tin, then turn out onto a plate, upside down so that the mastery of your pear arrangement can be admired. A little rustic, perhaps, but damned tasty!